옵션인 LAS Image Analysis 소프트웨어 모듈은 사용하기 편리한 순서 제어 모듈로, 다중이미지 특징을 획득하고, 검출하고, 측정하는 과정을 통해 안내합니다. 막대그래프, 파이(원) 그래프, 및 통계와 같은 다양한 분석 툴이 Microsoft Excel로 보낼 수 있는 중대한 관련 결과들을 생성하는데 도움을 줍니다. 향후 분석을 위해 정확하게 똑 같은 설정값 및 환경설정을 저장하고 재생성합니다. 많은 측정 매개변수 – 광범위한 용도로 사용하기에 적합합니다. 빠르게 측정되는 여러 대상물 – 결과를 즉시 볼 수 있으므로 수동작동에 비해 시간을 절약합니다. 저장된 설정값으로 작동 재현 – 오류없는 일상적인 사용이 가능합니다. 엑셀 형식의 쉬운 보고서 – 사용자 요구에 맞게 작성됩니다. LAS MultiStep의 데이터세트와 결합 – 개입없이 다중이미지 분석을 수행합니다. This video shows how easy the LAS software could be used to have objects counted and analyzed. This video shows the wide range of possiblities of the LAS software to measure and analyze specimens with complex structures. 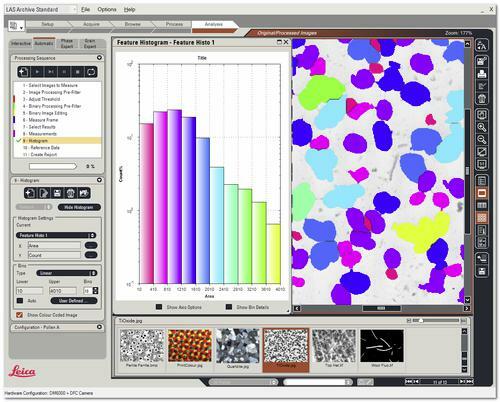 This video shows how the processing sequence is simplified in the Image Analysis Module. Select an image, select a grey-level filter, adjust the threshold and start the processing. Get repeatable results with automatic processing. Apply the particle sizing measurement sequence automatically to multiple images and create a detailed report in MS Excel™.